The HQ Scout III power kite has been refreshed to offer increased performance for flying in all conditions, especially in light wind. The increased performance which includes turning speed and power is now adjustable. The Scout III adjustability gives the flyer an easier time going upwind which is extremely important in your kiteboarding progression. The Scout III’s new design has set a new standard for stable and beginner friendly performance. The innovative X-Over control system has been incorporated into the kite bridle, allowing for a cleaner and more simplified control bar system. This reduced bridle improves everything including setup and take down time. The HQ Scout power kite offers quick turning and good response for being a fixed bridle. The Scout III is one of the top entry level land based power kites you can buy. 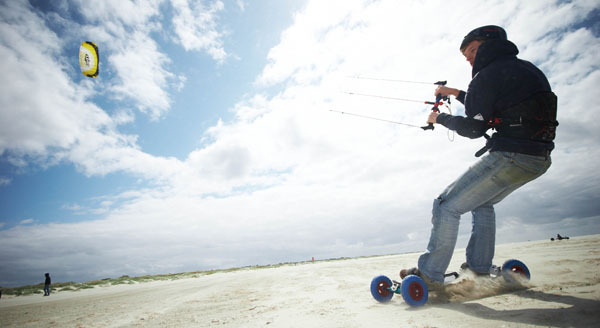 Its offers great power but the safety of a trainer kite with its fixed bridle system. The 4 line system can be used with or without a harness safely. The New HQ Scout III Kite, the successor to Beamer TSR, which was a tough built performer for years and the Scout III carries on that tradition. If you’re interested using a landboard, skateboard, or snowboard the SCOUT III will provide the power needed to get you moving. FREE DVD or KITE When You Order a HQ Scout III Today. Not Sure Which Trainer Kite is for you? Check Out ShadeOnMe's Trainer Kite Guide and See how the HQ Scout III did.